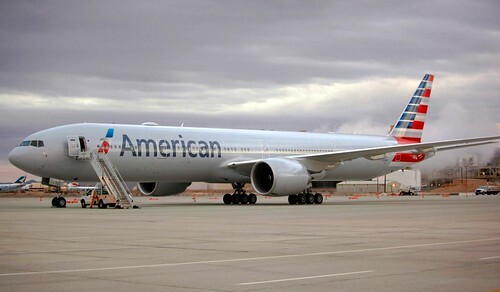 American has taken delivery of four new Boeing 777-300ER aircraft and more on the the way. They’re also about to start service between DFW and Seoul, South Korea. So I started wondering if all these new planes and the new international routes would have any effect on their domestic widebody schedules, specifically I was wondering if any 777-200s positioning flights might be added. It doesn’t look like there’s been any big changes, or any new 777 domestic service, but there are a few widebody service updates that are worth noting. One of the 2x daily, round-trip 757 flights between Dallas/Ft. Worth and San Juan will get upgraded to a 767-300 beginning in March. Seasonal, non-stop 767-300 service between Chicago and Honolulu is back. I assume it’s to accomodate the number of people fleeing the Chicago winter and not because people in Hawaii are tired of the monotony of perfect weather! Los Angeles and JFK lost one non-stop flight, in each direction. Going from 10 flights between the two cities, to 9 each day. Miami/JFK goes from three, round-trip, widebody flights per day down to two. A little surprising, considering that so many people head south for the winter. I actually though that if any route might get a 777-200 positioning flight, it might be this one. The SFO/JFK route gets reduced by one flight in each direction, going from five to four round-trip, non-stop widebody flights. This actually makes me a litte sad because AA flight 17, the 7:25 PM flight from JFK to SFO, has always been one of my favorites. American served the route for years with a 3 class 767-200. It left New York late enough that it was possible to put in a pretty full day working and not have to rush to get out to the airport in time to make the flight. Another advantage of leaving late in the day was that I could sit back, enjoy the the meal, watch some movies, and get caught up on some reading and email with the inflight wifi. The late hour made it easy for me to relax. The only domestic 777 routes continue to be between LAX/MIA and JFK/MIA. Go here to view a Google Docs spreadsheet with the the latest American Airlines domestic widebody schedule. The new Boeing 777-300ER has its maiden flight on Thursday. Terry Maxon of the Dallas Morning New aviation blog got a sneak peek last night, go here to see a few photos. The new plane is supposed to have wifi and the @AmericanAir team is planning to provide live coverage of the maiden flight on Facebook and Twitter. So keep an eye on both to follow the festivities! I’ll be out there too. If you’re planning to be on the flight or also attending the inaugural flight event, let me know with a comment or a tweet, I’d like to meet you and say hello! I think some SFOMIA frequencies are on 767s too ? Aadvantage Geek, will you be on the maiden flight too? @ perryplatypus – I wish! Unfortunately, I’ll be at the launch, but after that I’m working and traveling in the colder, and slightly less glamorous, American mid-west! Any news on the international routes once they keep getting more 777-300? All we know about is these “test” flights to GRU and LHR, but it would be nice if they started announcing which routes would get the new planes moving forward. LAX-PVG? MIA-EZE? MIA-GRU? @ Alex – According to Airline Routes the next route to get the 777-300ER will be DFW/LHR in early March, then JFK/LHR a few weeks later. For now, those are the only 77W flights that have been loaded in their operational schedule. They’ll be taking delivery of several more planes in the spring, I’m sure we’ll see some announcements soon. @ Jack – You’re right, they have non-stop 763 service between SFO and MIA. I started late last summer. Isn’t there also a dfw-lax 767 flight? @ downhillcrasher – You’re right, but they’re not new. I have them listed in the spreadsheet. I just listed the changes in the post. @ downhillcrasher – Thanks for commenting and reading! Completely agree with your points about AA 17 – really great timing for getting away for the weekend. I am definitely writing in about this, everyone else should too! @ David – The beauty of traveling on Superbowl Sunday is that airport is usually kind of quiet and the chance of an upgrade clearing go way up. Enjoy the flight! @ Albert – Agreed! Hopefully it’s just a seasonal cutback or a result of pilot retirements. I’m crossing my fingers that it will reappear on the schedule mid April. how can i find out which mia-jfk flights are on the 777-200 wide bodies? @ brl – It’s listed in the Google Docs spreadsheet that I link to in the post. One – each way, each day. Are you sure the spreadsheet is right? It lists AA647 JFK-MIA with 777 on Saturdays, but the schedule (http://www.trvlink.com/download/aa/AAschedules.pdf) lists it on 757. And, a random Saturday on the booking site also shows 757, for both AA647 and the AA1048 return.